While I was at Origins, one of them came in (actually three of them did, but I'm only talking about one here). The Ninth World is subtitled "A skillbuilding game set in the world of Numenera". I had a passing familiarity with Numenera before - my boys were interested in it when it came out. 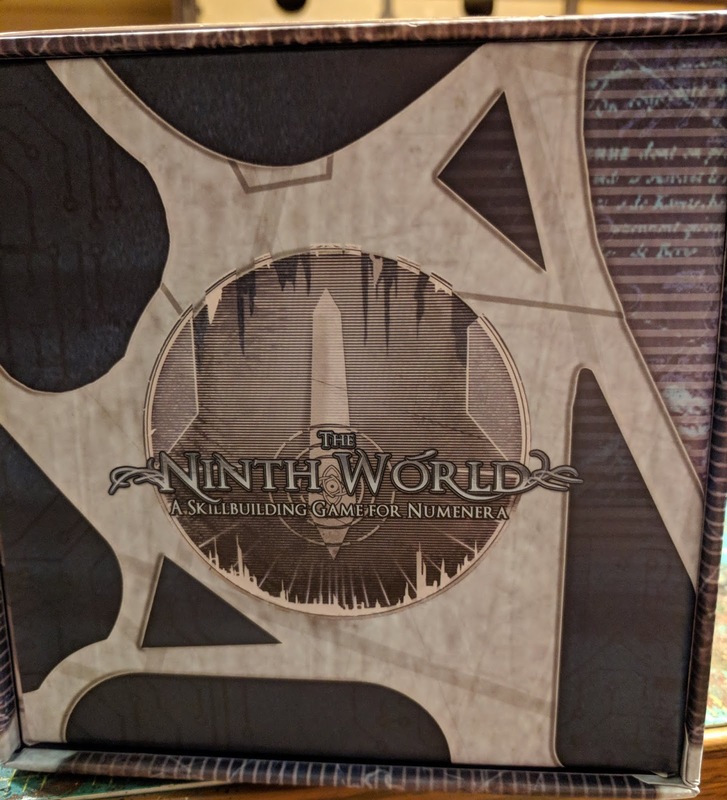 Set a billion years in the future, civilization has risen and fallen eight times in the past, and you play in the ninth world - or the ninth time civilization builds itself. Throughout the world there are ruins and artifacts that are from times so long ago no ones knows exactly what they did or why. 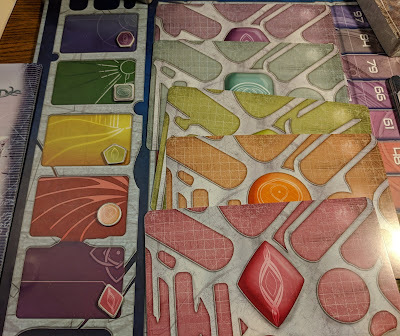 I have backed a few kickstarters from Lone Shark Games (including the awesome Maze of Games book (which I need to get back to and actually finish!)) 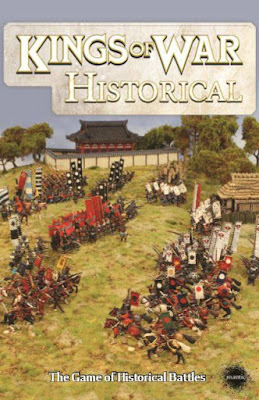 So this looked kind of interesting, so I threw a few dollars at it. I honestly wasn't all that thrilled about it but wanted to support Mike Sellinker and his company. I've of course seen the updates, but I wasn't really prepared for what arrived. I think this has the most amazing artwork of any game I own. I'm generally not a huge fanboy when it comes to game art - I want it to be nice and not get in the way of playing the game - but this seems to go several levels beyond that. 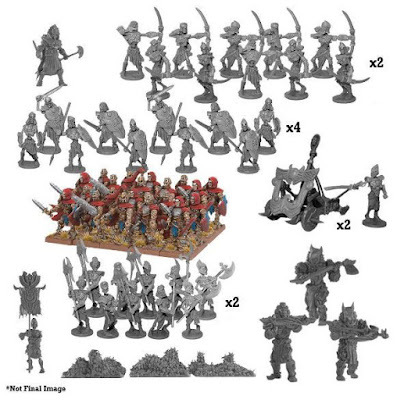 It starts with the base packaging. The vast majority of games come in standard rectangular boxes. This one is instead in a long narrow box - almost a square column. It has an outer paper wrapper, of which three sides are a triptych . 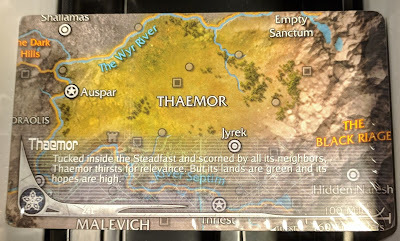 The back then as information about the game. 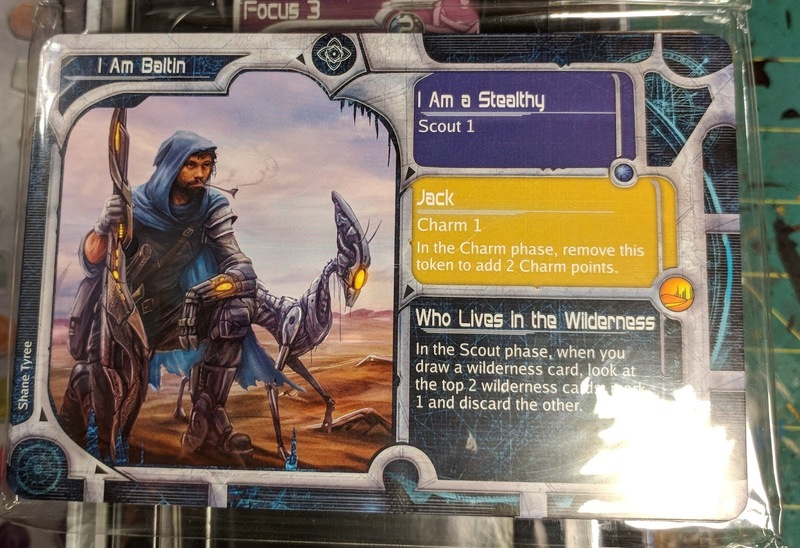 This is actually a sleeve around the game. Either end has the name of the game on it as well. The sleeve takes a little bit to get off the first time (it then slides on and off easily afterward). 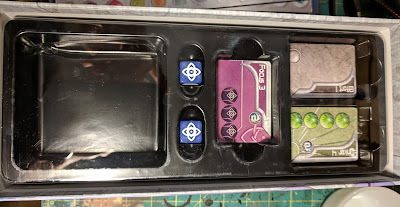 You want to keep this sleeve, as while the box has magnetic closures on it, they are not strong and if it is tipped on a side they easily open. 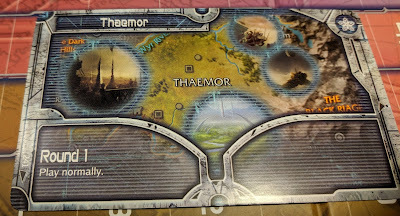 Sliding the sleeve off the box reveals a map of Numenera. 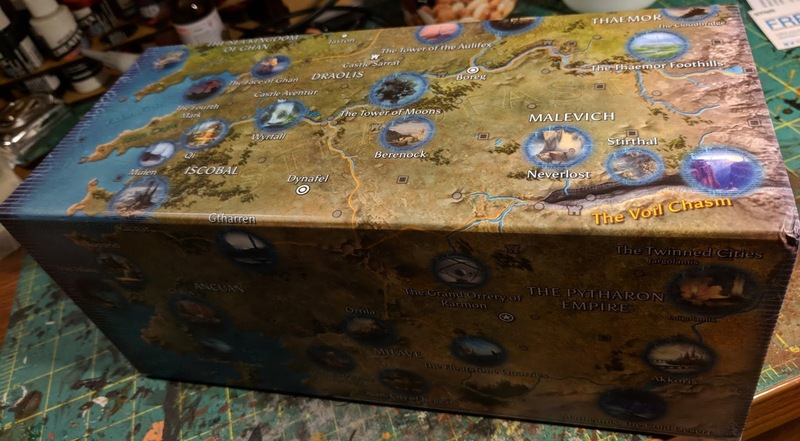 This wraps around the box in a single piece, unfolding to reveal the contents. The artwork for the map is beautiful - not only listing areas but giving little glimpses of what may be revealed in each of them. 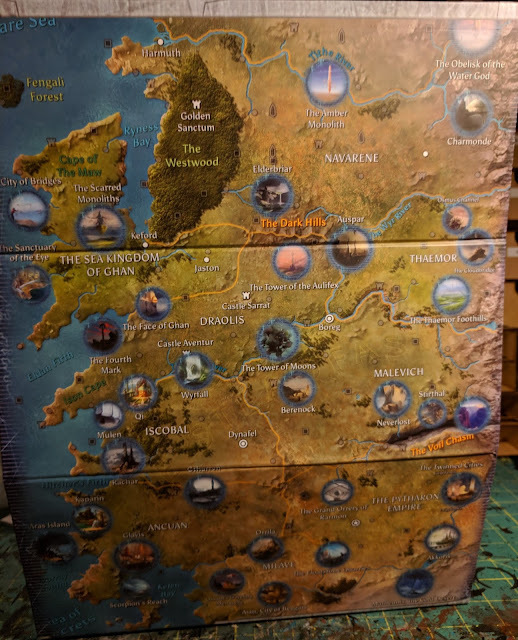 If each of these is a separate gaming 'region', then there is quite a bit of room for expansions before you use up all the areas on the map (the base game comes with 9 regions, and the Beyond Region expansion has 11 more to explore). 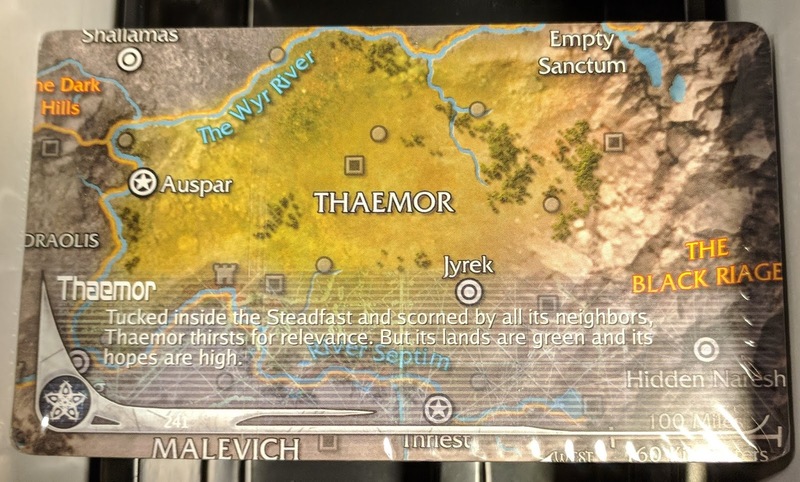 This map is just for information and fun, it is the inside that actually has the "valor" tracker (i.e. the scoreboard, as the player with the most valor at the end of the game wins). The actual box is at the end of this, with two plastic trays to hold all the components. While simple, the way the colors blend into a rainbow is very pleasing to me, ending up with areas for each color. (It actually reminds me of a picture I have on my wall - a simple fantasy landscape painting, with the paint dripping off into various pots of colors at the bottom). and under those are two plastic trays. The top holds two dice and as places for three decks of smaller cards. In addition there is a big space to keep the counters after you have punched them out. 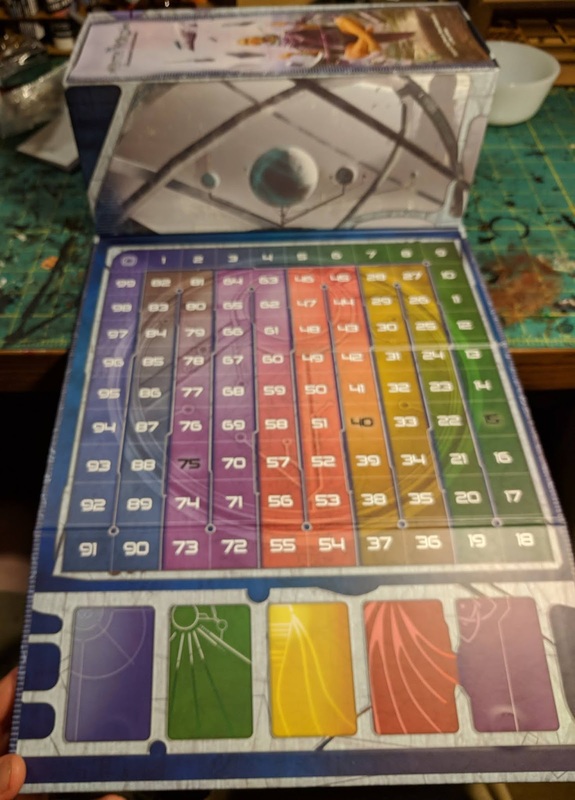 It also has a clear plastic lid that fits over this tray, to keep the components from spilling in the box when you roll up the board and slip on the sleeve. The small cards here are the skill, wound / power cards. 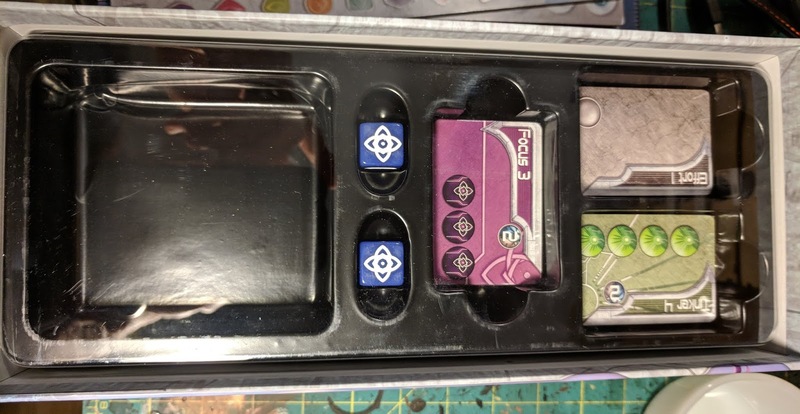 The custom dice have two positive, two neutral and two negative sides on them. 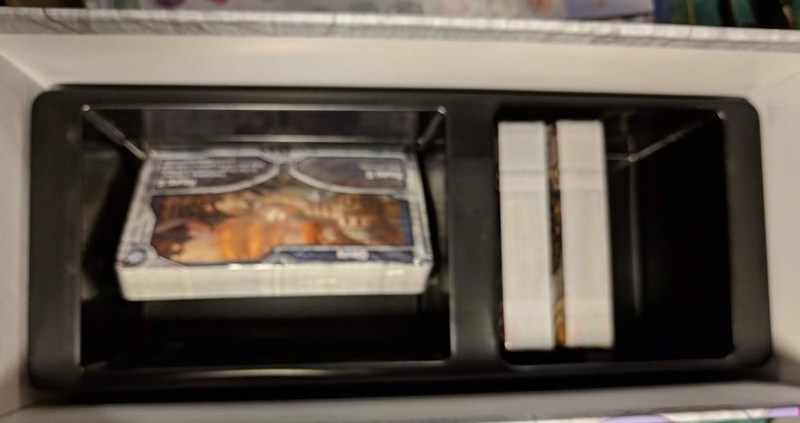 The bottom tray has places to hold more cards, or two different sizes (so there are four sized of cards in the game). 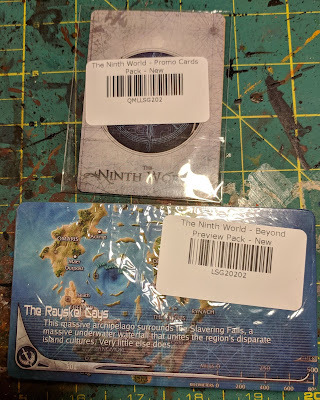 Since this was a kickstarter, I of course got the available expansions for it - which were some of the smaller encounter cards, and a large set of new region cards. 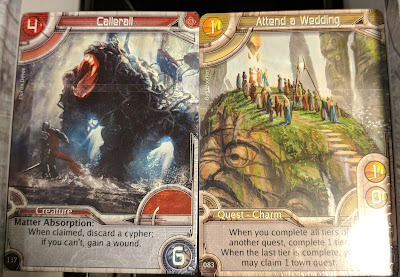 I want to go into a bit more detail on all these cards. First up are the largest - these are the character tableaus (there are four for each type of character (Nano, Glaive and Jack). 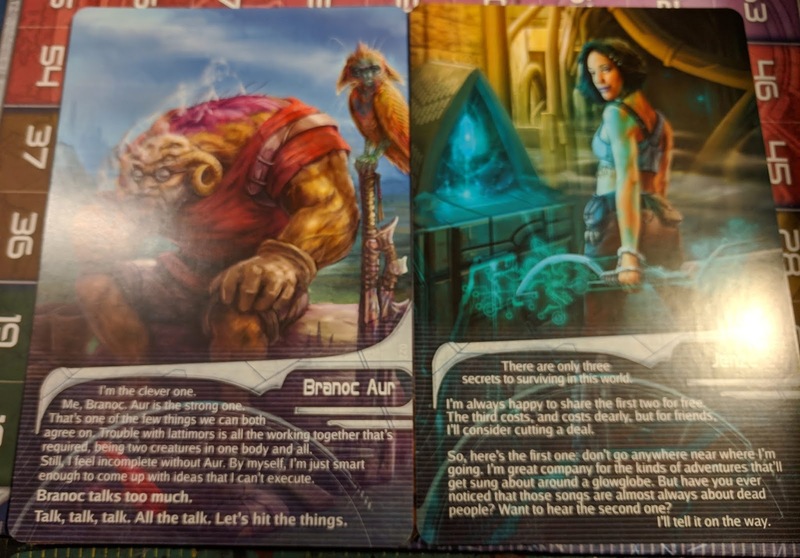 On the back of each of these is a large portrait of the character, and some descriptive 'flavor' text for them. Each of these is simply a fantastic piece of artwork - and I can already see the possibility of a book on the art of Numenera coming out some day. I was just really impressed with these. For game play, you use the front, which has the same, smaller picture, plus three bits defining the character. 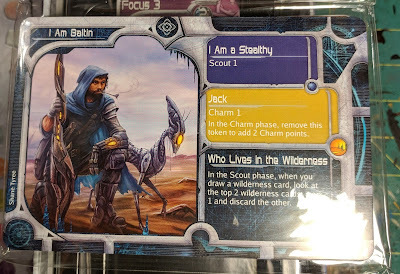 Each characters has a name, and abilities whic are defined by filling in the phrase "I am a _____ ______, who _____." The first blank is an adjective which ties into a specific skill. The second is one of the three character types (each of which also has a skill tied to it). The final blank is a phrase that ties to a specific individual ability the character has. So you have Branoc Aur, who is a clever Glaive who weilds power with precision. 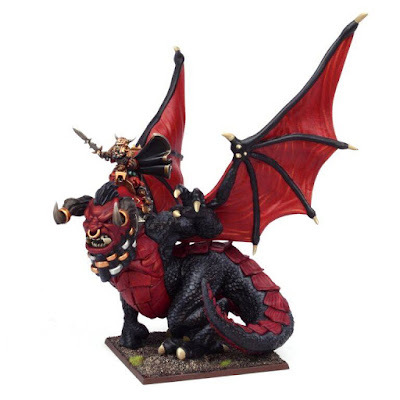 This gives him the skills Tinker 1 and Combat 1, as well as a unique ability. Jenza is a Charming Nano who Entertains, starting with the skills Charm 1 and Tinker 1 as well as her own ability. 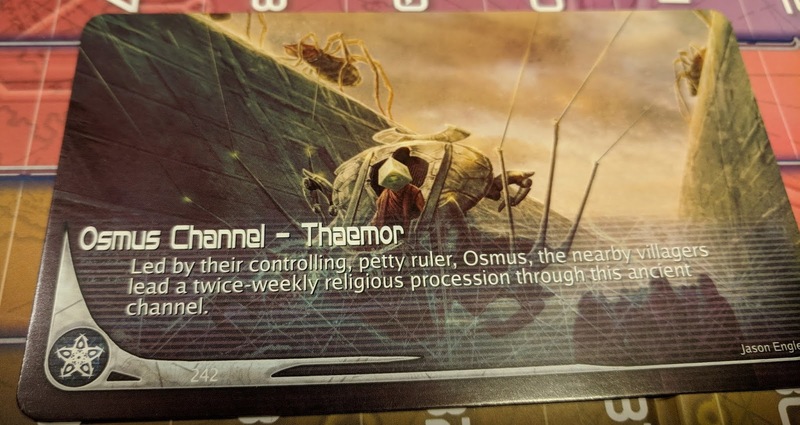 All the cards in the set are numbered - though I wonder where cards 1-20 are (it seems a bit strange that these would be in an expansion). Maybe they are for more characters to be released later? 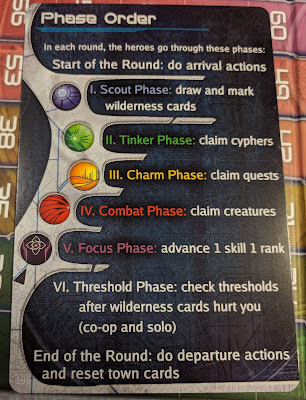 There is also a Phase Order card that lists the things you do each turn. The back of this lists the valor thresholds you must attain by certain turns in order to win the game in co-op or solo mode. Each of the phases is tied into a color and skill - Scout, Tinker, Charm, Combat and Focus. The way the colors (and symbols on each) are repeated is very nice. 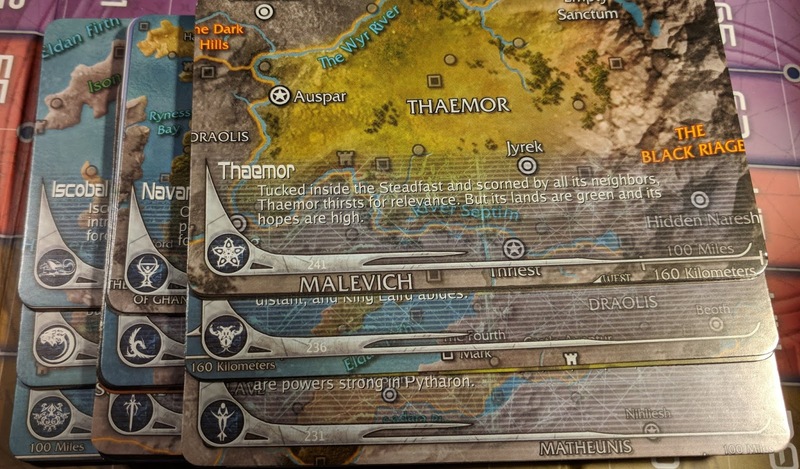 The front of each region card two areas, listing the round in which you visit it. (Round 1, Round 2 & 9, Round 3 & 8, Round 4 & 7 and Round 5 & 6). A normal game has 9 rounds, but you can also do a short game having only five. When you are visiting a region, there may be a special rule that comes into play either when you enter it (i.e. the start of the round), while you are there, or when you leave (the end of the turn). 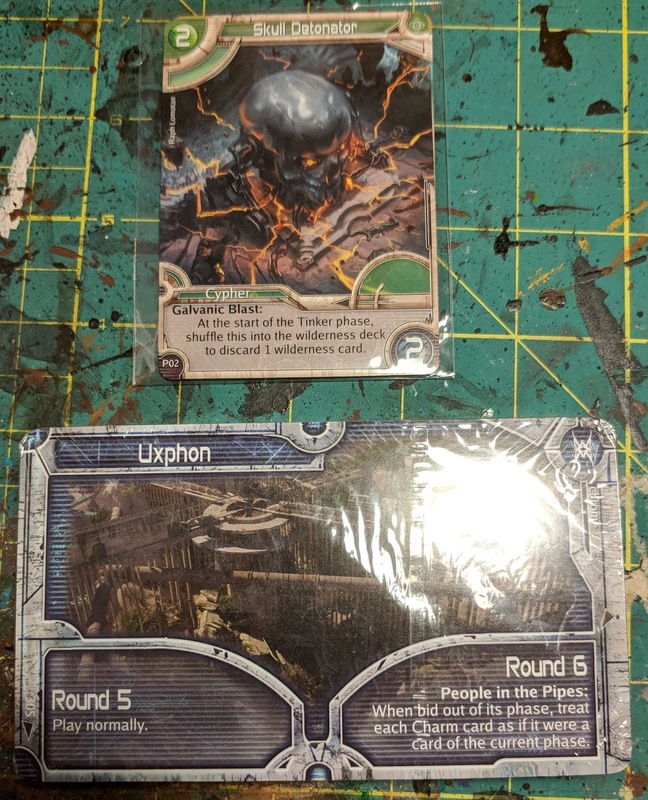 When playing, you lay out the region cards in order so you can moved from move down for rounds 1-5 on the left, then back up for rounds 6-9 on the right of the cards. The artwork for these is again amazing - both the map (which is a small section from the box) as well as the art for each region - evoking a different feel to each one. 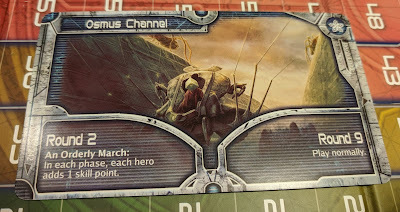 The artwork for the encounter cards is just as good. Here the subjects are creatures and events (instead of landscapes for regions). 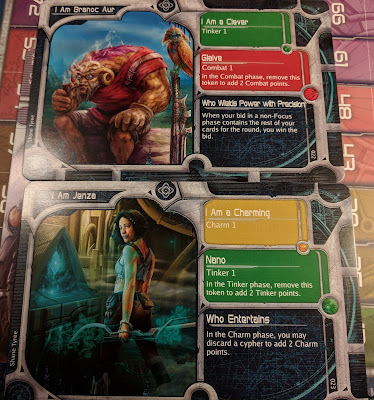 There are four type of encounter cards. 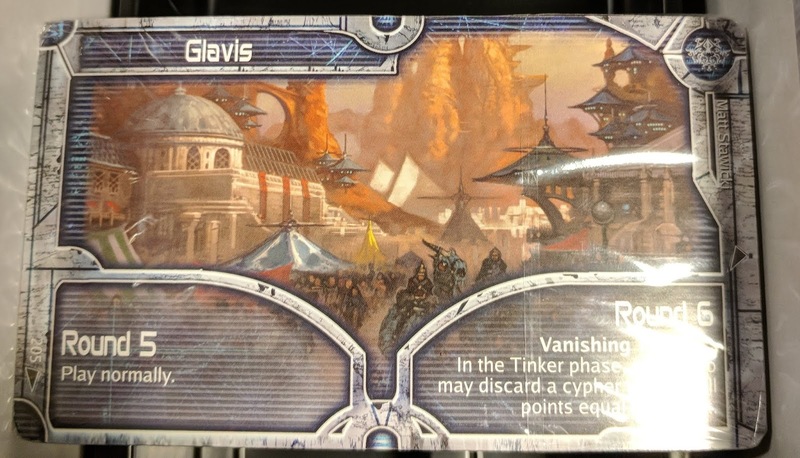 Cyphers are puzzles, equipment and items you find and must figure out. Creatures are the monsters you must fight - some of these actually cause wounds which stop you from using your power until they are healed. In the wilderness deck there are also prizes - these are scored immediately by the player that draws them and then replaced. 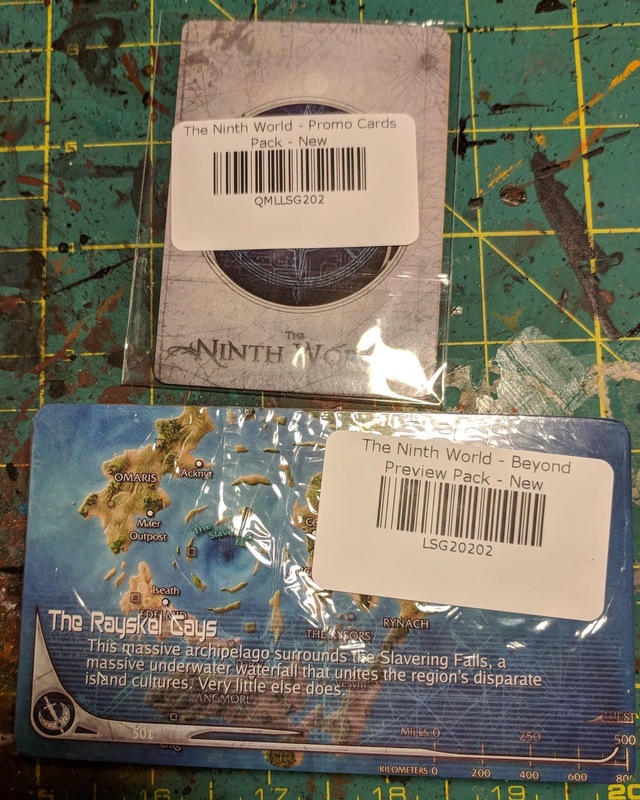 For all of these three types, the number in the upper left is what is required to 'acquire' the card. This can only be done in the appropriate phase (so to claim the drone, you must spend 3 skill points in the tinker phase, and to defeat the Erynth Grask requires 5 points in the combat phase). The number in the lower right is the valor you immediately receive when claiming the card. The last type are quest cards - and you can have a quest for any phase. These work a little differently. When claiming a quest you don't just get the valor for claiming the card, you then must actually complete the quest. 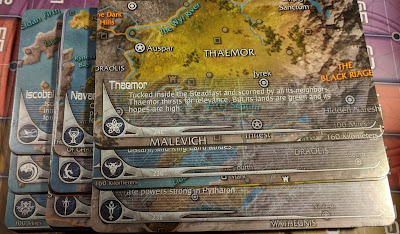 Each quest has tiers on the lower right, and the text of the card will describe how to complete a tier. When you complete a tier, you get the valor listed in the circle for it. Some of these may also trigger other effects when the quest is complete. 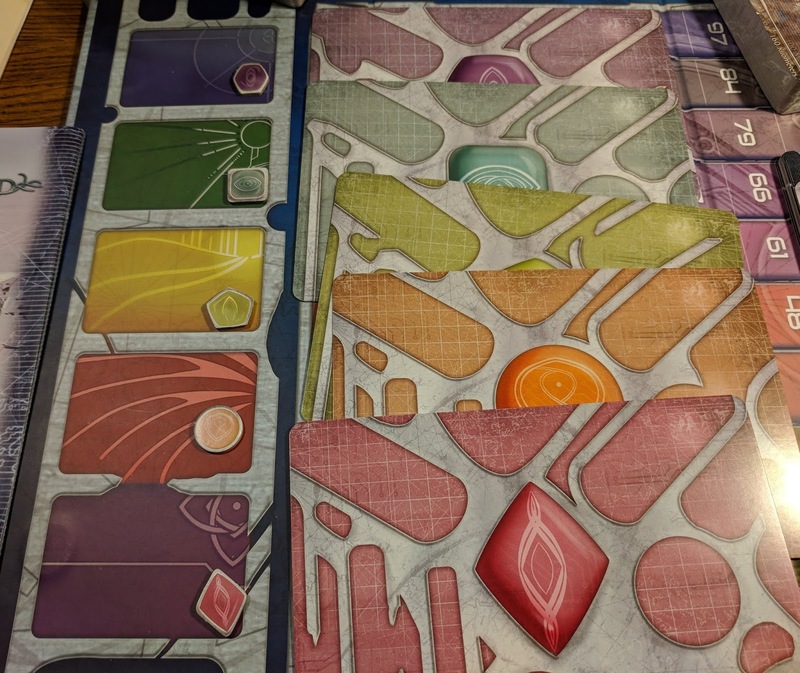 Because the encounter cards need to be random, they don't have larger versions of the artwork on them (like the region and character cards do), which is a shame due to the quality of the artwork throughout the set. 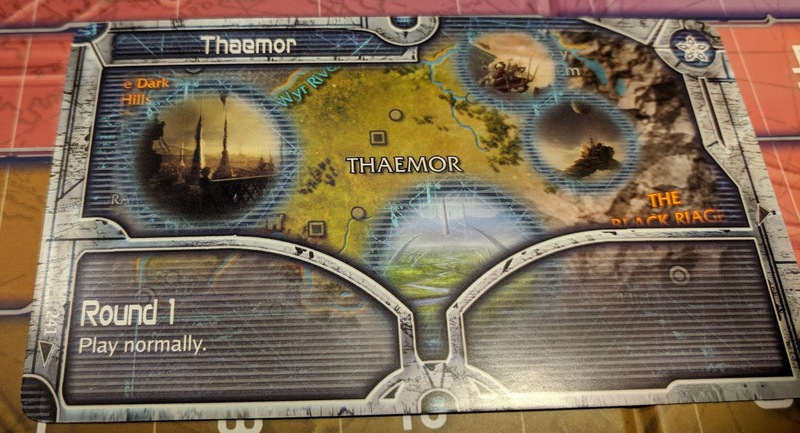 The one thing I did not get through the kickstarter was the playmat. I've often thought of these as ok, but not really necessary. However once I saw a picture of it, and tried a solo game - I can really see the usefulness of it for organizing the play area. 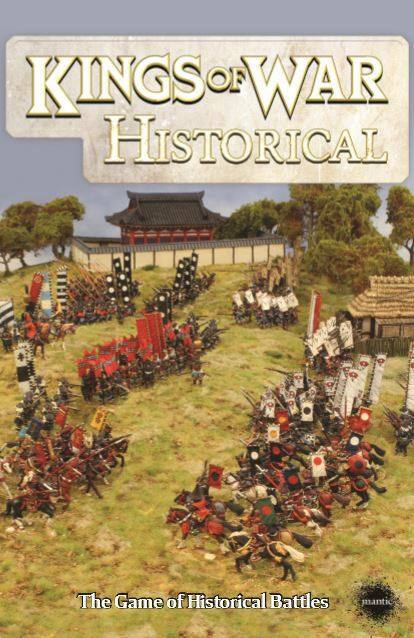 So much so that I wished I had picked one up at Origins (I saw the Lone Shark booth, but didn't stop in). Had I done that, I would have it already, and not had to pay the extra shipping and tax that was added on when I ordered it online (the game released to retail officially on June 20th). 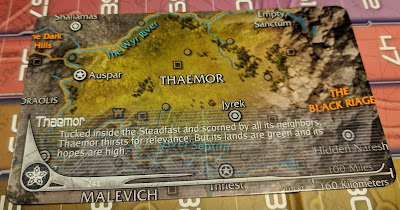 So how did it play? I didn't quite finish a solo game - for one it takes a bit more room than I anticipated (I was using a small tray table). The box / scoring track is really cool - but it also means you can't put the box out of the way while playing the game. 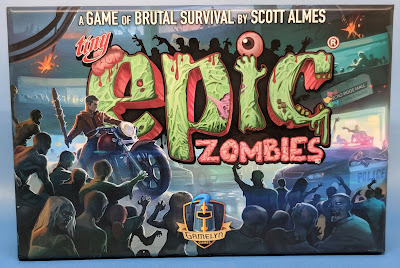 The co-op and solo (solo is simply co-op with only one player (and you get three one-shot ally characters)) was challenging. 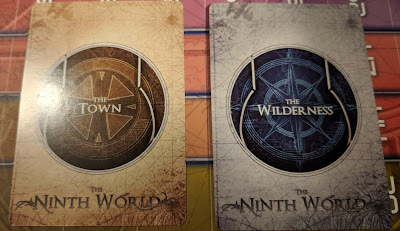 It has an interesting dynamic where all the wilderness cards that are out at the end of a round 'hurt' you - creatures attack the town (if the town takes five wounds then you lose the game, and you cannot heal wounds on the city). Quests force you to draw more wilderness cards (at the end of each round, you draw a wilderness card for each hero AND one for each quest in the wilderness). 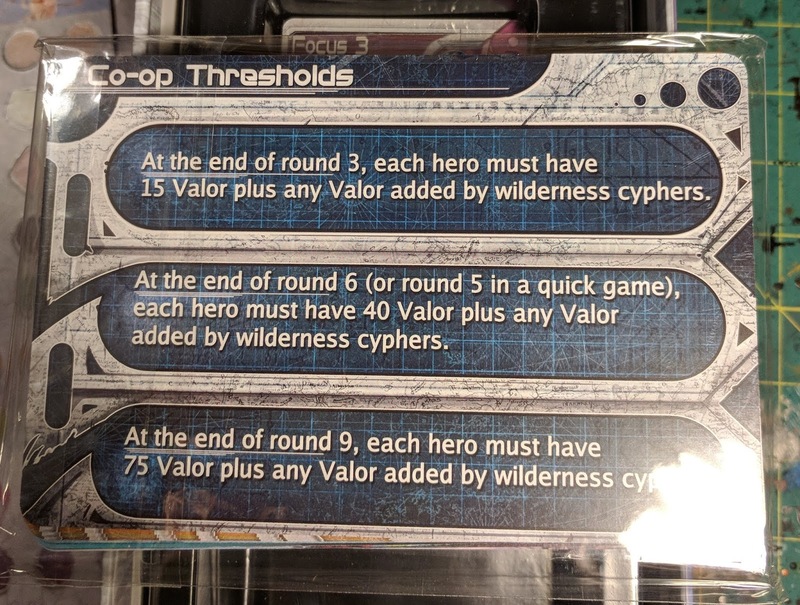 Cypers make the valor goal increase by one (in the co-op game, all players must have specific valor scores at the end of round 3, 6 and 9 (or 3 and 5 for a quick game (initially 15, 40 and 75)). If you don't have the required valor, you lose. (When checking valor, you also must subtract one for every wound your character has). Overall it was fun. 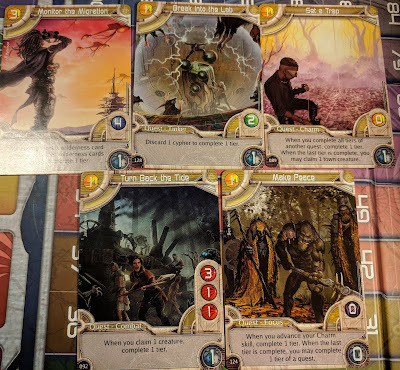 For some reason I was thinking it was a 'legacy' type game where you could advance the heroes, but it is not - you simply start fresh with each game (like a standard deck builder, but here you always have 5 cards and you can improve a single card each round). 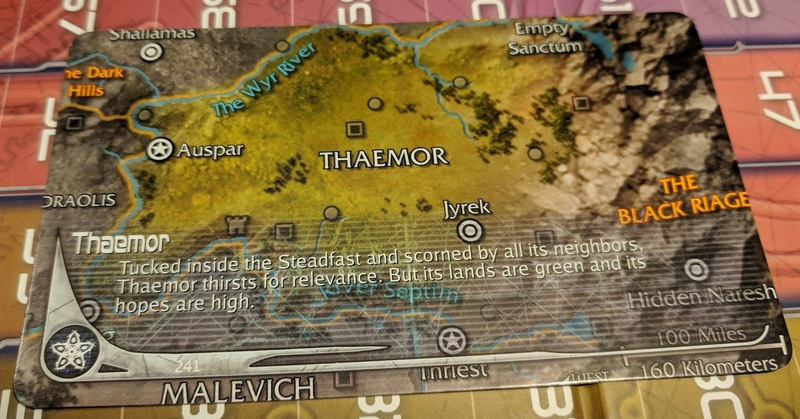 With the expansion there are 20 different regions (the expansion adds powers to regions that are in effect the entire game). 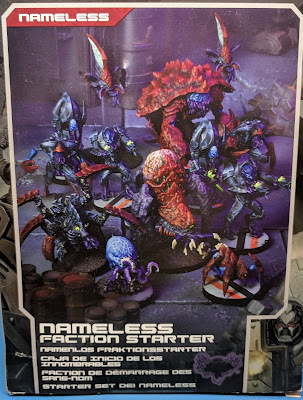 I do look forward to giving this a try with some friends.